Hi everyone, I have done a few Kindergarten themed units, and wanted to add in a new one today! Introducing my Mail Carrier Unit Study! This one is geared for preschool to Kindergarten and just introduces one of our very helpful community workers to younger students. Lesson 1: Introduction: Introduce the mail carrier career to your students. 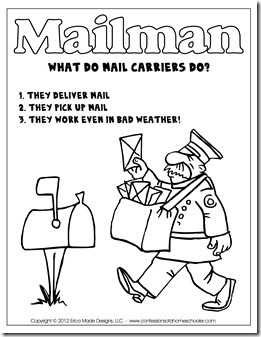 Ask if they know what a mail carrier does, and how they go about doing it. Tell students that mail carriers are responsible for picking up mail to be sent, as well as delivering mail to residents in their specific area. Mail carriers work no matter what the weather, but not on national holidays. 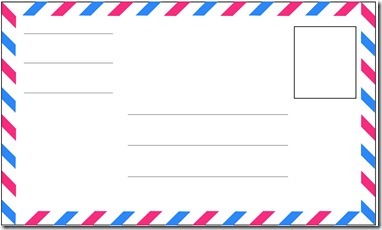 Lesson 2: Envelope Activity: Help students learn how to properly address the below envelope to someone they like. 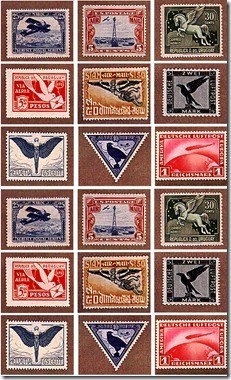 Have them color in a pretty stamp for their letter in the box provided. Make sure to tell them where the mailing address and return address go on an envelope, and what they’re used for. Activity: Have students write a letter, or color a picture and have them actually mail it to a family member. Lesson 3: Mailbox Craft: Cut out the mailbox pieces and color. Glue flag to mailbox and then carefully tape the door piece to the mailbox along the bottom so it will flap open. Activity: Have students write their last name, or street address on their mailbox. You can use the letter template on page 6. 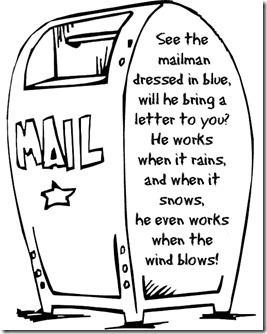 Lesson 4: Mail Carrier Poem: Read the poem to students, then help them memorize the mail carrier poem. 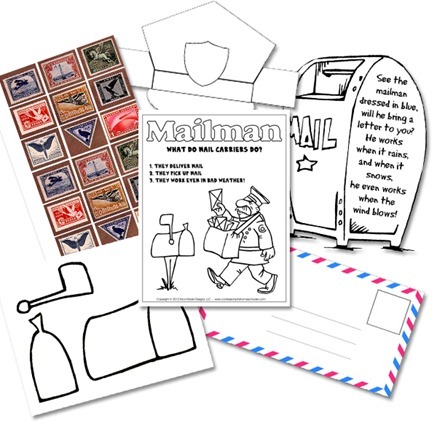 Activity: Color and cut out the mail carrier poem worksheet. 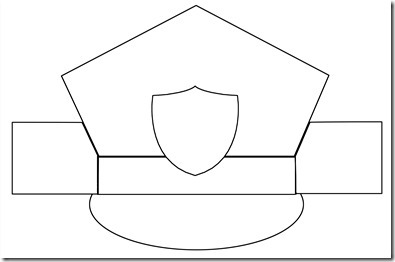 Lesson 5: Stamp Memory Game: Cut out the below stamps and place them face down on a flat surface. Play stamp memory: take turns flipping two cards over. If they match you get to keep them. If not, you have to turn them back over and let another player have a turn. Player with most matches at the end of the game wins! Can be played with one player as well! Activity: Cut out fake letters, or use real envelopes. Have students pretend to be mail carriers and deliver mail to other students in the room. Lesson 7: Field Trip: If possible, take a field trip to a local post office to see how they operate. You may also stop your mail carrier, and ask a few questions next time you see them! Have mail carrier activity ideas for kids? Leave a comment below to share your ideas! This is really neat! Thanks so much for offering it. My boys will really like it. Thanks so much. I am planning on starting homeschooling for the 1st time this summer w/ a soon to be 1st grader and twin preschoolers, feeling lost so have been searching and gathering links and pages, but still feel really lost w/ all the stuff out there and not know what they need and when. Thanks so much for all you do for this blog! I am beginning homeschooling for the first time this fall, a kindergartener and two preschoolers. I can honestly say that your site has been a HUGE blessing to me! Just showing me how to organize and plan, and offering curriculum ideas, etc. I thank you from the bottom of my heart <3 Just out of curiosity, when you do a unit study, do you do a lesson every day? Or spread it out a bit to make it last longer, say maybe do the unit lessons on mon, wed, and fri? I am such a planner and need details lol 🙂 Thanks!!! Oh I wish I still had a kindergartener! This is so well done! Makes me miss schooling my kids when they were little(er)! This is great! My husband and I adopted a 6 year old little girl last February and we have just started home school with your alphabet units. Her daddy is a letter carrier so this will help her learn about what he does at work! I love it! Thank you! 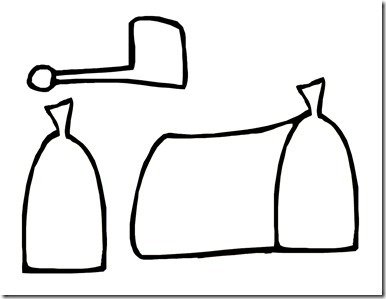 I would love ideas for community service for little ones. Thursday is our “serving other’s” day and we cleaned out the pantry and donated food to our church for their benevolence. I would like to keep doing things every Thursday and would love ideas. My email is julie@ablecc.net. Thank you again for this wonderful unit. Thanks so much for this! My first grader was writing a letter to her Grammy and I wanted a model for her to address the envelope. Found this unit and got SO much more!! I sure wish I’d had the internet twenty years ago when I first started homeschooling. I’m so thankful for people like you who so graciously make things like this available. With my oldest, if I wanted something like this, I had to make it by hand…no computer even! Homeschooling is so much easier with such awesome resources available. thanks for this,i’m a teacher in belgium.your idéas are so good.thanks a lot. Thank you, Thank you I am so thankful to you and what you share. I can’t wait to us this material.